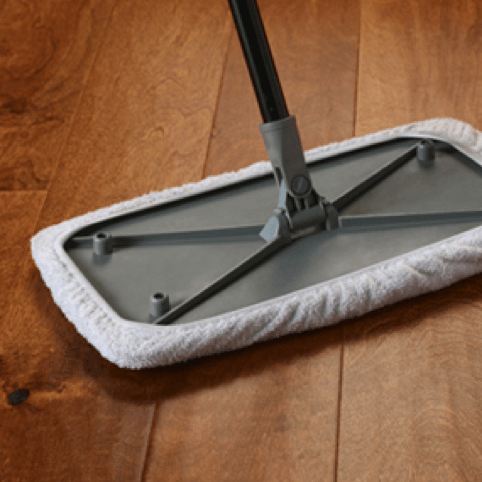 How should you clean luxury vinyl plank? Many of today’s resilient (vinyl) flooring are 100% waterproof, making them a great flooring option for bathrooms, dens, and kitchens. While many manufacturers offer water resistant technology built into the plank and tile finish, it is still important to wipe away water spills as quickly as possible. Our flooring experts here at Bassett Carpets have put together the following helpful tips on how to care for your new luxury vinyl tiles and planks. Frequent care and maintenance of your luxury vinyl tiles and planks can be quickly and easily built into your overall home cleaning routine! For daily upkeep, sweep, dust, mop or use a manufacturer approved vacuum cleaner without a beater bar. If your flooring needs more than just a dry surface clean, use a manufacturer approved cleaning solution and follow their guidelines. For most approved cleaning solutions, you simply just need to spray and wipe dry without any unnecessary rinsing or washing. When it comes to those common household spills, quickly wipe away with a micro-cloth and once dry, follow up with a manufacturer approved hard surface floor cleaner to keep your floors looking great! For tougher household messes like wax, gum, or nail polish, consult with your manufacturer guidelines for approved stain removal tips.